On our way home from Laurel Hedge Oma, Opa, Naiya and I stopped by the Swan Island Dahlia Farm for their Annual Dahlia Festival. This family run farm has been in existence for 84 years and has expanded over the decades to grow over 350 varieties of dahlias on their 40 acres of lush land in the Willamette Valley in Canby, Oregon. They're the leading dahlia grower in the U.S. and their gorgeous fields and display room are a delight to the senses. Yesterday we made it to the Art in the Garden event at Laurel Hedge in Estacada. We've been to this designer garden/boutique nursery before but attended this fourth annual art event for the first time this year. Out of respect for the artists, I didn't photograph any of the work displayed around the beautiful grounds but I did get a few detailed shots of the garden that I didn't include in the last post highlighting this inspirational gardening paradise. I wish I were more familiar with the botanical names and categories and had more photos of the unusual and interesting specimens of plants which highlight the many design concepts exhibited in the garden. Instead what I tend to emphasize with my shots are the charming structures, fountains and statuary that the eye of my four year old pinpoints which subsequently draw my camera. We especially liked watching the bees drinking from the bird bath this time around. Every now and again I come across a place to visit or a product or a store that I think is worth sharing. Sometimes I'm surprised to find these things quite close to home and am shocked I didn't know about them sooner. Well, I'd been hearing about Ruhl Bee Supply from various beekeepers I know and finally went to check them out. They're located in Gladstone, Oregon (just outside of Portland) and have been supplying and educating beekeepers in the local area for over 100 years. 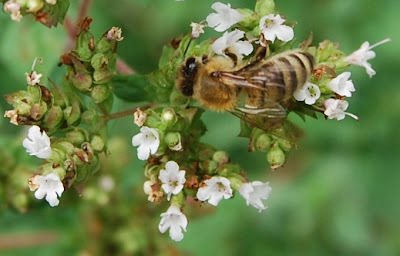 We've been thinking about adding bees to our urban homestead and they have hives, classes and all the supplies we'd need (for both honey and mason bees) but, it turns out they also have quite a selection of crafting materials. They carry soap, skin care and candle making provisions as well as local honey, pollen, propolis and royal jelly. I'm not affiliated with them in any way. No one's paying me for any kind of endorsement. I just think it's a great store. If you're in the area, I'd recommend stopping by for a visit. For those nowhere close, they also have online shopping. Since we've been making our own beeswax polish, balm and candles, what made them most worth while for us was the pound of beeswax for $6.25! That's less than half of what I've been paying elsewhere. We sometimes paint with tempura but Saturday Painting Day is most often an adventure in wet-on-wet watercolor. We love to hang the beautiful finished products of Painting Day around the house, but we also keep a store of them to make cards for various occasions and as charming backgrounds to the many verses and poems that we post here and there. Unlike regular painting or drawing, wet-on-wet painting, by nature of the medium, is about color and movement and not so much about form. Because the paper is wet, distinct figures and configurations continually transform on the page so this kind of painting seems almost to have a life of its own. The process is slow and gentle and, performed mindfully and with reverence, it is a magical undertaking for children and adults alike. With that in mind (and to avoid the wild and frenetic tendency of other activities) we often begin this afternoon by setting a tone of calm centeredness. Sometimes we'll light a candle after we've prepared our space and just prior to picking up our brushes we'll say a special verse or read a poem. After our verse, either we just paint or I'll talk about a mood or a color or a feeling. One of our favorite subjects is times of the day. In Oregon, especially in the Summer, right before dusk, there's a subtle but amazing change in the light some days so that everything is golden and the air kind of shimmers (it lasts for only about five or ten minutes). We'll talk about something like that and then we'll both pick up a brush and each tenderly place color on paper. Maybe we'll feel guided by our talk, maybe not. Sometimes our hands and the hues and the light have lives of their own. We generally paint with between one and three colors. Today was an exception because Naiya was interested in rainbows. Somehow, in the end, I always think they're beautiful. Each of our weekly afternoon activities are pretty specific and we do essentially the same kind of thing each time around. Craft Day though encompasses a really broad spectrum of projects, occasionally gets a little weird and often is very messy. In our case, "crafts", generally speaking, deviate from the routine paint, paper and crayons that we use all the time but can include such typical elements as glue and glitter. More often they're even more unconventional. We have used this day for pouring candles, whipping up a new batch of play dough, sewing, paper folding, fabricating lanterns, felting, finger knitting, sticker art, papier-mâché or even making bird feeders. Basically, it's a day for all the interesting things we think to do that don't fit into the formats of the other days of the week. A lot of times we do our seasonal crafts to add to the Nature Table on Friday or, if we're impressively organized, we'll put together gifts for upcoming birthdays and whatnot. Today was rather ordinary for a Craft Day. Naiya wasn't even interested in adding glitter or beads or sparkles to our project and fundamentally, all we did was paint. We've had these houses for a while now and she's been wanting to decorate them to add to the growing neighborhood in the fairie garden. After we finished the houses she got really interested in color combining and brought out some paper she found in the supply cabinet. After mixing colors on the pages, she folded them in half, pounded on them with a stone and declared them beautiful. They really are, and the idea came completely from her. This is the magic of free art. Thursday in our home is Drawing Day. As I've mentioned before, I have never "taught" Naiya how to draw. I generally stay away from coloring books and don't instruct her on the how-to of figure rendering or architectural outline. I do draw alongside her, but I have always been interested to see what would happen in her art if she were just given the tools and then been allowed to let color, movement and imagination be her ultimate guides. When we gave her a permanent dedicated art area in our home, her interest increased significantly as did the quantity of beautiful works she produced. (She, of course, draws, paints and models wax on her own even when those activities are not a specified part of our daily rhythm.) As in many homes, we've found a novel way to display a plethora of her lovely creations but struggle with what to do with the excess. I have such a difficult time just throwing them away. It's been interesting to see her human forms evolve and then revert back to some previous stage. (A while back the people had legs but they have now returned to the classic single peg.) Sometimes they have heads and even faces; on other days they're simple stick crosses with hair. Mostly she draws people, houses and gardens (both vegetable and flower). I suppose that's because those are her primary interests and, having limited drawing skills myself, those are my own default subjects. One thing we've done that has inspired new subject matter and some interesting variations in her work is to change the size and shape of the paper on which she draws. We make them long and skinny and lay those both horizontally and vertically or we cut triangles, circles, butterflies, pumpkins or even just odd organic forms. When I give her a tiny, tiny piece of paper to draw on she squeals with delight and then laughs and laughs. She loves drawing tiny pictures. Each day we have both a morning chore and an afternoon activity. Wednesday, though, is just Family Day. I mentioned that I had oral surgery last week and, honestly, still feel a little out of sorts. Since I haven't felt much like writing, I've been using this week to share our rhythm of afternoon activities. Every day following Quiet Time, Naiya and I (and daddy when he's home) take part in some recurring pastime. I usually call this "craft time" because many of our pursuits are arty/crafty but a few of our days deviate from classic crafts with time outside, in the kitchen or on some kind of adventure. Wednesday (which, at the moment, is effectively part of the "weekend" in our home) is Family Day and is always great fun because daddy spends it with us. We're often out on a local hike, visiting a farm or park, picking fruit in fields or an orchard or just playing together with those we love. One end of our yard, just beyond the chickens, is dedicated to food production. Mostly we experiment there with grand visions of acreage we may some day own. Truly, experiment is the word. We'd like to think of ourselves as gardeners and hope one day to produce most of what we eat on our own property, but I think those days might be farther away than we hope. Three years ago neither of us had really successfully grown any kind of crop. These days we manage to harvest delicious tomatoes, lettuces, various greens, squash, blueberries, strawberries, onions, peas, beans, beets, potatoes and garlic. Being novices, we're still working on the how-to specifics though. That and figuring out interesting recipes for beets or tomatoes or zucchini or whatever we're inundated with briefly but intensely as each successive crop fills baskets, jars and bowls in our kitchen, pantry and basement. Last year we planted garlic in the Fall and harvested in the late Summer (a little belatedly since some of the bulbs, although edible, were insufficiently protected by the dead outer layer). This time around then, we decided to plant in Spring (because we'd been told the long slumber of the cloves over Winter really makes little difference) and we harvested today. The leaves and stalks were about half green, half brown (which is apparently the optimum time to dig them up). Alas, although the yield was again usable, our garlic was rather diminutive. I'm guessing our tiny bulbs were, in fact, the result of the Spring planting. Next year's garlic plan: plant in Fall; harvest mid-Summer. Good thing we've still got the Farmer's Market. I had some surgery in my mouth last week and haven't eaten solid food for six days. Baking day is a bit of a torment this time around. In our home Sunday is Beeswax Day. Many months ago everything changed when we learned to soften the wax in a bowl of warm water. As a part of our daily rhythm at home we have crafts (or painting, drawing, baking, etc.) every day after quiet time. Last week when we were out at the cabin at Olallie Lake then, I wanted to carry something of the sort with us into our temporary outdoor life. For a bit of a change, and also to embrace the natural world we were celebrating, I scoured the internet for outdoor natural craft ideas. We brought along a bunch of yarn, string, wire, paper, crayons and a manual drill to make manifest the myriad projects, but we also used many of the organic materials we found as we wandered the lakeside and hiking trails. It was a great change-up from our standard watercolors, beeswax and glitter and Naiya especially enjoyed the daily treasure hunts. One of the first things we put together was inspired by all the tangled bits of fishing line we found on our little beach. This mobile is perhaps hard to see as it hangs from the rafters of our cabin porch but it is composed of that found fishing line, pine cones, shells and smooth water sculpted segments of wood. The trick was attaching all the pieces to create balance and beauty that delightfully twirled in the afternoon breeze. From Donni over at The Magic Onions we found this pretty pendant idea. (Click here for a quick tutorial.) Pendants can, of course, be made from anything found including small stones, seed cones, shells or even pretty pieces of wood. I remember making these as a child and I found a tutorial for an Ojo de Dios or God's Eye over at Natural Suburbia. We used found wood for these and made them with either two or three sticks. I think they're prettiest with some kind of variegated yarn. We were hoping to locate a greater variety of flowers but even with just the lupin and a few buttercups we were able to do some flower pounding and fill our cabin with a wall full of art. We found a flower pounding tutorial from At the Butterfly Ball and had even brought along a hammer for this activity. In the end, Naiya preferred using a flat, smooth stone she found. We must have done "flower mash" (as she called it) two or three times a day. Another activity that consumed our little one was just pounding nails and drilling screws into stumps we found lying about. For some reason the cabins at the lake always seem to have stray hardware around their perimeters. (The result of poor clean-up from the refurbishing done some years ago?) Anyhow, we remembered this and brought the hand drill for just this purpose. It's still a little unwieldy for a four year old so we opted for hammering more often that drilling. Again, those smooth, flat rocks come in mighty handy. Kelly at Freeflowing Ways has a tutorial on these lovely Pressed Flower Sun Catchers. We didn't bring any tissue paper when we went camping but still plan to try these at home. Over at Acorn Pies, Beth has a tutorial on How to Make a Toy Boat out of Sticks. Since we were lakeside, we thought this would be great fun. It turned out to be too difficult for the four year old and we just threw chunks of bark in the water instead. We'll certainly try this one again when she's older though. Lastly, from Lady of the Arts we found a how-to for Nature Marionettes. I'm thinking that these also would have been too difficult for a child as young as ours (and we didn't get around to trying them) but what fantastically creative women there are out there in blogland! Do visit them if you get a chance and, while the weather holds, we hope you have the opportunity to enjoy all the goodness Nature provides for art projects of your own. The most common flowers (other than Lupin) that we found up at Olallie Lake were the huge blossoms that rose from boundless clumps of Bear Grass (xerophyllum tenax). These plants present a really beautiful bloom and aren't really part of the grass family at all but are, as I understand it, more closely related to a lily. One day, as Naiya stripped the tall stalk of its petals and seeds, she asked if we could plant the seeds in our garden at home. "Okay," she said, "then we can grow bears in our back yard." We're back! I'm ending another blogging hiatus to let you know we've just returned from a recent vacation up at Olallie Lake. This trip was a repeat of one we did last year with the addition of mosquitoes, tantrums and letterboxes and a reduction in caught fish. Still, it was a relaxing week in a beautiful area with great weather. Olallie Lake is up in Mt. Hood National Forest within the shadow of Mt. Jefferson in an area home to over 200 lakes and small ponds and endless fields of huckleberries. By state law the lake is un-swimmable and motorized vehicles are forbidden but it is stocked with rainbow and brook trout. Apparently the 7,000 fish they released there were caught prior to our arrival though. Or so say the diligent but unrewarded fishermen. As usual, we took a few hikes on this trip. This time around we used some Letterboxing clues to lead us up new and interesting paths (and into some pretty intense mosquito breeding grounds as well). (For more info on Letterboxing visit here or here.) Below are various shots of our circumscription of Monan Lake which Naiya loves for the many plank paths which keep one from treading in the swampy grounds surrounding the pristine waters. We were unable to locate the letterbox we searched for there but did find a series of them on other adventures to Timber Lake and Upper Lake. These hikes were both beautiful and burdensome. The mosquitoes were out in full force, especially where the numerous small ponds lined the sides of the trails. Let it not be said that our every moment is lightness and joy (although the great majority of them really are). For some reason this time around, Naiya was a rather unpleasant hiking companion. Her feet were sore; she was tired; she was hungry; she was hot; over and over again, she just could not take another step. Her loud complaints and screams were enough to keep away all wildlife (except the unwanted insects that continually attacked us). Coupled with the swarms of biting, flying beasties and the continuously disconsolate child, we practically ran some of these paths carrying her on our shoulders and only saw the glorious flora, fauna and incredible views in a passing blur. In the end, we spent the bulk of our time just relaxing around our cabin, hanging out at the beach down the path, swimming at a lake a short walk up the road and doing various natural crafts. Of course, mommy brought along baskets full of crafting supplies and we produced quite a collection of handmade goodness both from natural found objects and things we brought from home.